Sure, Aspen is known for its world-renowned skiing, but we’re loved as a year-round natural mountain escape. When the snow melts, our mountain town comes alive with a combination of outdoor adventure, Arts & Culture, restaurants and a way of life like nowhere else on Earth. So lace up your hiking boots and start exploring your next trip to Aspen. We’ve got a few recommendations on things to do here to get you started. Our favorite residents share their knowledge and insights to all that Aspen has to offer. We’ve pulled out the best activities, events and highlights to help you make the most of your stay. Aspen has a temperate climate, allowing us to experience four distinct seasons throughout the year. Spring, Summer, Fall and Winter each offer unique opportunities for recreation, sight-seeing, and relaxation. You've got kids with boundless energy, and we've got recreation! There are so many ways to enjoy Aspen, both indoors and out. A cultural "outpost" famed for its embrace of the arts, Aspen is a small town with big city cultural appeal. With more than 300 days of sunshine a year, Aspen is truly a year-round destination for outdoor enthusiasts and adventurers! With more restaurants than in recent years - well over 80 - old favorites mesh with fresh menus and new talent to provide enough culinary options to please any palate. Shopping in Aspen isn't only for the designer-inclined diva. 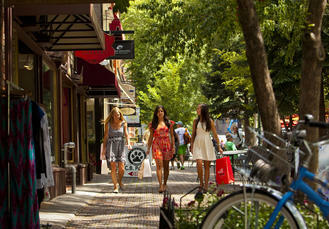 Choices for shopping here in Aspen run the gamut from consignment to Prada. Tried and true outerwear is also on hand for your next mountain adventure. Aspen's pedestrian malls are the perfect place for a leisurely shopping excursion where one can find fine art, clothing and gear. Aspen's Saturday Market (every Saturday from June 13th through October 10th, 8 a.m. - 3 p.m. After Labor Day 9 a.m. - 3 p.m.) is another great draw and showcases locally grown produce and artisans while being a great place for socializing too. Live music is on hand to keep your spirits up as you shop around for a little bit of everything.